FEEBLEBMX.COM Feeble BMX Vancouver - Searching for VAN HOMAN? He's not here. No FREE STICKERS either. This review used to be a thumbs down but bear creek has turned into a good park again. It has a nice big pyramid and volcano, good street features, and a U shaped bank with hips at either end. The city of surrey decided at one point to cover this park in anti-grafitti paint which makes all of these good features unrideable. You could literally turn sideways on the volcano and double tire slide down the side of it. 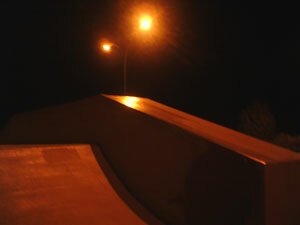 We went there on a thursday night and we were the only ones there, no one was riding it and no one was skating it. I'm sure that the locals have seen some crazy bails on this new ultra slick surface. Well a while after the park was painted with ultra slick, anti-graffiti paint the park got painted again with crazy yellow red and blue grippy paint. I am glad to say that the park is fully ridable again. 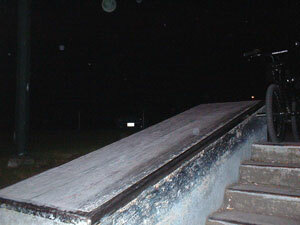 At the hang-out end of the park there is a 4 set with two ledges and a rail going down it. The ledges are really fun and start out at a bit above peg height, the rail is about stem height and is made of two rails welded together so it's nice and solid looking. After that there is a unique and cool fun box with a slope leading up to a 3-stair with a ledge all along one side and a square rail all along the other. From the top of the stairs the rail is maybe just below upper headset cup height, somewhere around there. Down the middle of the park is a 4' tall volcano and then a 5' tall pyramid. At the back of the park is a big U shaped bank with a little tombstone in the middle and hips at either end, take a look at the panorama shot. On the other side of the park is a 3 sided funbox with a nice high ledge going up, across, and down one side. Behind the fun box is a long flat rail that sits at just over tire height. It's at a really nice height and it slides really good. Not too skinny not too fat. Also while you are there check out the whoopty whoop trail that has a bunch of pumpable bumps all in a row, it's pretty fun. All in all i think that this is a pretty good park design. There are a few interesting street obstacles, some fun ledges, and a good flat bar. The rest of the park was ruined by the super slick and dangerous anti-grafitti paint that the city put on everything, but now that the paint is gone the park is fun again. There are so many good lines over the hips, pyramid and volcano. With the new paint the park looks like a clown college but it's fun as hell to ride again. Along king george hwy in bear creek park. Take the Skytrain Expo line to King George Station and ride South along King George Hwy. The park is on your left, just past 88th Ave. The King George Skytrain Station is at 100th ave. so you only have to ride 12 blocks. Too bad they are monster sized Surrey blocks. 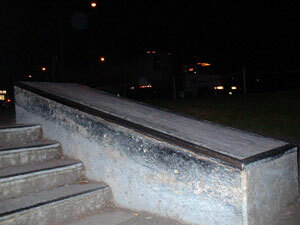 Here's the right side ledge going down the 4 stair, fun. 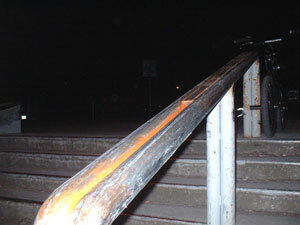 The left side ledge. you can also grind the other sides of these two ledges. 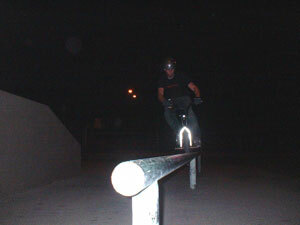 Here i am grinding the square rail on the funbox thing. This looks like something you'd find on the street. 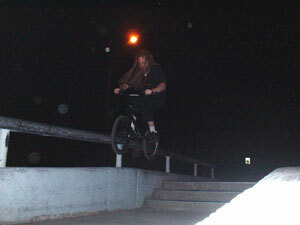 This is the round, flat bar. Just over tire height and long enough to be really fun. Flash gets in a doublepeg grind shot. 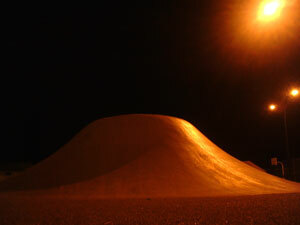 This is an arty pic of the 4' volcano. Doesn't that look fun? Here's a pic of the ledge on the 3 sided funbox. Check the panorama shot to see the rest of it.